A blooming separation from the traditional Sun Face Decor, our fabulous new Aqua Sunburst Sun delivers happy sunshine into your home and garden all year long. 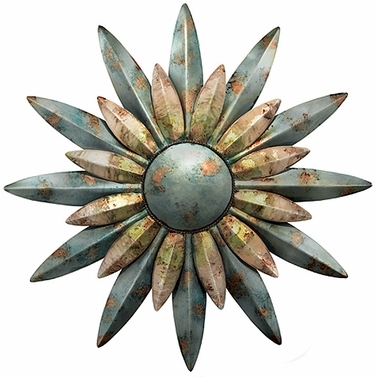 This unique metal sun decor offers a wonderful variation when standard hues of reds and oranges and browns are not always desired. More abstract in nature, this Sun easily transcends form to be enjoyed also as a blooming flowering burst of Garden Fun! This gorgeous Aqua Sunburst Sun is made of durable metal and intended for outdoor use. You will love how this flowering sun decor brings beauty and warmth into your life. Place it indoors, in your office, by your patio, or on a wall or fence in any outdoor garden landscape. Works great as the hero piece, or in multiple sets as accent decor pieces. Outdoor sun decor has never looked this good! Size: 29 x 29 inches.